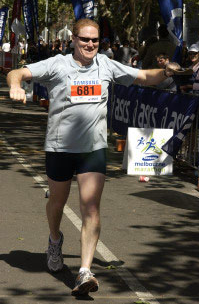 Blue » Blog Archive » At the finish line. A few folks wanted to see what the fat old guy looked like after 5hrs of running. Not too bad, I think – I could still muster a smile! This entry was posted on Wednesday, October 11th, 2006 at 11:48 pm	and is filed under Personal, Running. You can follow any responses to this entry through the RSS 2.0 feed. Both comments and pings are currently closed.